SIR Ranulph Fiennes, the explorer has discovered clues that could lead to the discovery of a fabled civilisation which flourished 5,000 years ago before being lost in the sands of Oman. 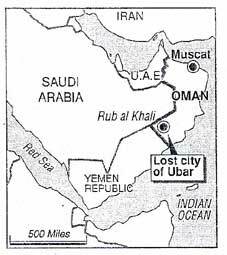 Sir Ranulph, the co-leader of an expedition to the remote Rub al Khali  The Empty Quarter  in Oman said yesterday that he had found traces of the people of Ad and their legendary city of Ubar, named Irem in the Koran. With Mr Nicholas Clapp, an American film maker, the expedition had found more than 900 artefacts and an ancient road system buried in the massive sand dunes of the Empty Quarter, about 600 miles south-west of Omans capital Muscat. The discoveries were made with the use of the latest technology including satellite images from the Challenger Space Shuttle and radar. Excavation of the site is expected to begin in November once permission has been given by the Sultan of Oman. The search for the city began for Sir Ranulph in 1970 when he was commanding a military reconnaissance platoon in the region. About one mile of the ancient road has been discovered, plus pottery shards.